In his quiet, gentle way, Ninh Tran is crystal clear about the impact he wants to have with his philanthropy. Since high school, Ninh has thought a lot about how he could have an impact in the world. He considered politics but settled on medicine, earning his MD from Queen’s University and completing his residency in family medicine and public health here at McMaster. 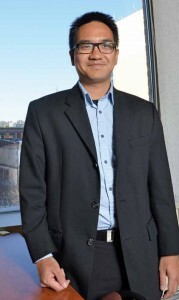 He is currently Associate Medical Officer of Health for the City of Hamilton. Dr. Tran started the Tran Family Fund at Hamilton Community Foundation in 2011. It will support programs that help youth reach their full potential. “You don’t have to be a millionaire to begin making a difference,” he says. “I’ve started small. I will get experience and learn as I go along. I hope others will contribute and help build the fund up over time.” He already has ideas about using social media to promote awareness of philanthropic opportunities and the impact of giving. Donations are welcome. To give online click here or for more information, please contact the Hamilton Community Foundation.